Velour is a fabric that is similar to velvet, with a thick, soft nap that makes it luxurious to the touch. Unlike velvet, however, velour is a knit, which changes the properties of the fabric rather dramatically and makes it highly stretchy. There are many uses for this fabric, including upholstery, clothing, cloth diapers and pillowcases. 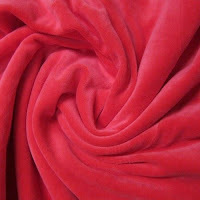 Many fabric supply stores carry velour in an assortment of c olors and in large quantities. This fabric’s ability to stretch is why it is often chosen for workout and casual wear, because it will give easily with the movements of the wearer. Velour typically is made from cotton, which makes it very plush, easy to care for and affordable. It might also be made from artificial materials, such as polyester, depending on the manufacturer and the intended use. Extremely elastic fibers are used by some manufacturers to make it especially stretchy and flexible. In upholstery applications, this fabric is found on couches, on car seats and in drapery. The fabric is often used because it is more giving than velvet and less likely to become damaged through hard wear. It also is relatively easy to care for, especially when compared with velvet. When velour is used as upholstery, it might be treated with flame-resistant compounds or made from a flame-resistant thread to increase safety. This is especially important with drapery.